20 lab beagles have been released and are hoping to be adopted. For the first time in their doggy lives, a group of beagles are stepping out into a world they have never known. “They were kept in cages. 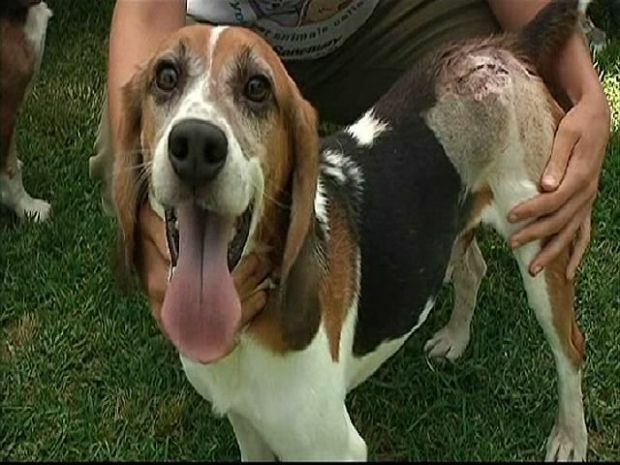 They never saw the outdoors," said Shannon Keith from the Beagle Freedom Project. "They had no enrichment in their lives like toys or quality food." For the past seven years, the dogs have been living in animal testing labs. The Four Paws Rescue Center said they don't know the specifics on what they were tested for but they know they have been tested with medication and had their blood taken. “Labs typically use beagles because they are submissive, trusting and giving. The exact reason that people like to have beagles is the same reason they are tested on,” said Keith. Shannon Keith from the Beagle Freedom Project talks about how 20 dogs were freed from animal testing and are now available for adoption. The rescue group says they received a call two weeks ago from the lab asking if they could take in the beagles. They are now working to find homes for them to start living life like a real dog should. “Usually within a few months they get to be a real dog again," said Keith. "They really start to love life, toys and going for walks. It’s amazing to see the transformation." If you are interested in adopting or fostering a beagle, you can visit the Beagle Freedom Project website.